Japan's Akatsuki spacecraft missed its chance Monday to enter orbit around Venus, and the next opportunity will not come for another six years, according to statements by the Japan Aerospace Exploration Agency. The $300 million unmanned mission was supposed to fire its primary thruster at 2349 GMT (6:49 p.m. EST) Monday. Officials anticipated a communications blackout of about 22 minutes during and after the engine burn, but ground controllers did not regain contact with the probe for more than 90 minutes. When engineers heard from Akatsuki again, it was only communicating through a low-gain antenna and officials concluded the spacecraft was in safe mode but still alive. After more than a day of analysis, JAXA finally declared the 1,000-pound probe failed to enter orbit around Venus as planned. "We have found that the orbiter was not injected into the planned orbit as a result of orbit estimation," JAXA said in a statement Wednesday. Akatsuki, which means "dawn" in Japanese, launched May 20 on an H-2A rocket from the Tanegashima Space Center. It journeyed 300 million miles between blastoff and the planned Venus orbit insertion maneuver Monday. The project is managed by JAXA and its Institute of Space and Astronautical Science division. "JAXA has set up an investigation team led by ISAS Director within JAXA to study the cause of the failure," the JAXA release said. "We will update you with the countermeasures and investigation results." Akatsuki is at the mercy of orbital mechanics, so it will be six years before the spacecraft is again in the vicinity of Venus. The alignment of the planets and the probe's trajectory dictate when it can make another attempt to enter orbit around Venus. 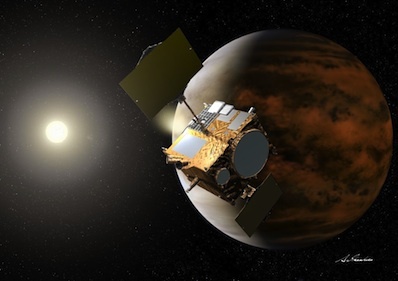 Akatsuki is Japan's second mission to miss an opportunity to enter orbit around another planet. The Nozomi mission missed two chances to orbit Mars. The robotic orbiter was supposed to arrive at Mars in 1999, but a valve malfunction left the probe without enough propellant to reach the Red Planet. Officials replanned the mission to enter Martian orbit in 2003, but a solar flare zapped the spacecraft in 2002 and left it too damaged to attempt any arrival maneuvers at Mars. The Akatsuki spacecraft was supposed to begin science observations at Venus in January, beginning a two-year mission of studying the sweltering planet's atmosphere and searching for active volcanoes. Akatsuki's five cameras are designed to collect unparalleled data on the planet's hot, thick atmosphere and runaway greenhouse effect for a two-year mission. Akatsuki also carries sensors to look for active volcanoes and search for lightning storms.